Snaresbrook Primary – DfE’s actions are disproportionate and unjust. 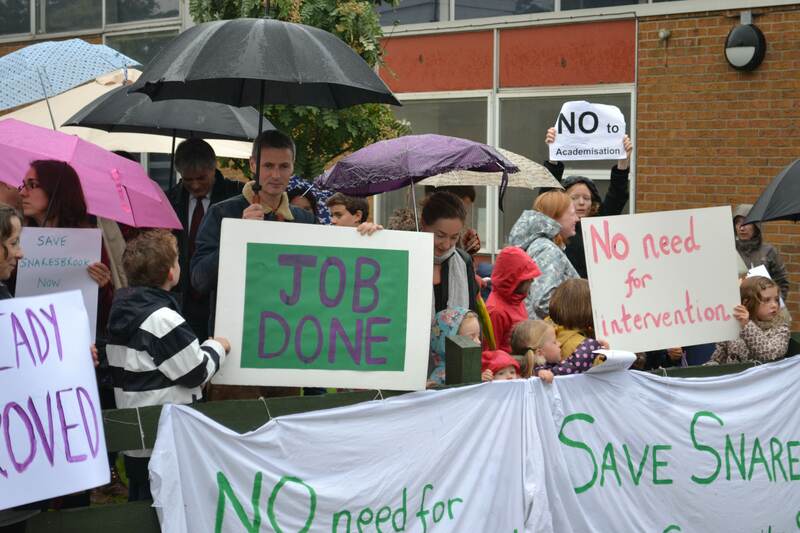 Snaresbrook Primary School parents in East London are saying “no” to the proposed academisation of this much loved and successful local community school. The school is not failing – in fact it is among the best in the borough. Parents, the local community, councillors across all parties and MPs are all in agreement: “Snaresbrook Primary School is not broken and doesn’t need mending.” What’s more, the conduct of the Department of Eduction in this instance is disproportionate and potentially unlawful. The school has experienced a performance dip since its ‘good’ Ofsted rating in 2012. This has led to an Ofsted rating in June 2013 of ‘special measures’, attributed to poor leadership. However, prior to this inspection, the LEA had become aware of the problems and dealt with them through the planned departures of the head teacher and chair of the board of governors, as well as the appointment of a vibrant deputy head, Julie Wilson, who immediately identified weaknesses and set about improving SATs. In fact, the May 2013 SATs results are the 4th highest in Redbridge, and the school’s best for 5 years (see note 1). Sadly, these results were not taken into account in the damning Ofsted report. These leadership changes were accelerated in response to Ofsted’s report, resulting in the immediate removal of the head teacher and chair of the board of governors and the appointment of an excellent executive head, Carel Buxton who has National Leadership in Education status, alongside the associate head, Julie Wilson. The improvements are immediate, visible and sustainable (see note 2) – evidenced by the SATs results and improvement plans. 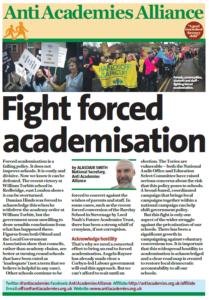 In spite of this, the Department of Education has already initiated the academisation process, ignoring these rapid improvements and the wishes of all other stakeholders. A “broker” from the DfE, Jacky Griffin, has met with school’s governing body, senior management and representatives from the LEA, to discuss academisation and proposals for a sponsor. We consider the use of Ofsted findings to trigger immediate intervention to be potentially unlawful as it negates the purpose of the Ofsted regime. As per Ofsted guidance produced this month, a school in ‘special measures’ must be given a proper opportunity to prove itself capable of lasting change, through a system of monitoring and inspection. It suggests a school should be given at least 12 months after the inspection that placed it in special measures to prove itself. If, after 12 months, there is insufficient improvement, it is only then the DfE should consider alternatives; not straight away (see note 3). Parents and carers are also shocked at the lack of objective published guidance as to how the DfE are to make decisions under the Academy Act. The lack of clarity is frightening but also makes the process entirely unfair. The views of the parents and local community are overwhelming: around 89% of parents who have expressed a view have said “no” to academisation (see note 4); around 150 parents, carers and children staged a protest outside the school during the DfE meeting; and on 19 September, Redbridge Council passed an emergency motion showing unanimous cross-party support for keeping the school within the Redbridge family of schools. John Cryer MP, NUT, National Association of Head Teachers, and the Anti-Academies Alliance, have all shown their support and are assisting us in lobbying the Secretary of State for Education. What’s more, around 1,000 members of public have signed on- and off-line petitions in support of our cause. The DfE is failing to take account of the school’s excellent track record and recent rapid improvement measures, stating that only an Academy can bring about required changes. Public decisions are being made with closed minds and no regard for the alternatives. We know these to be grounds raised regularly in judicial review, and we will fight this as far as we can. Our 2013 SATs results are the fourth highest in Redbridge: key stage 1 – 90% level 2+ in reading and writing, and 92% in maths; key stage 2 – 87% level 4+ in reading, writing and maths, and 40% at level 5, while 10% of children received a level 6 in maths, and 3% achieved level 6 in reading. We believe the swift improvement in SATS results (the school has climbed 22 places within the borough in a year) to be the result of the ‘astute and focused work’ (Ofsted report 2013) of Julie Wilson, newly appointed as Associate Head. The measurable targets for the school include 80% and above of all lessons being ‘good’ or ‘outstanding’ by January 2014 and at least a ‘good’ result in autumn 2014, when Ofsted formally returns to the school. Milestones in the action plan have been shared with parents as they have been achieved, and we as parents will hold the school’s leadership accountable for future targets. Guidance published by Ofsted this month sets out the system of monitoring and inspection that should take place after a special measures finding. It suggests a school should be given at least 12 months after the inspection that placed it in special measures to prove itself. If, after 12 months, there is insufficient improvement, it is only then the DfE should consider alternatives; not straight away (para 10-13, Ofsted Guidance: Monitoring Inspections of Schools that are Subject to Special Measures, September 2013, No. 120221). In an informal survey of Snaresbrook parents and carers at the school gates, the school voted overwhelmingly against academisation. The volume of responses received represents around 70% of the parent/carer population, and of those who gave an opinion, 89% were against academisation. 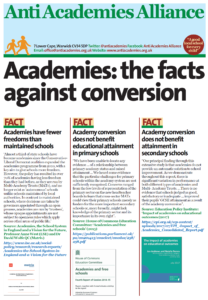 This entry was posted in News and tagged Forced academisation, Gove, Governors, Primary. Bookmark the permalink. One Response to Snaresbrook Primary – DfE’s actions are disproportionate and unjust. It is extremely good news on many fronts how you are fighting draconian DfE behaviour. That you recognise the meaning of Ofsted ratings – yet the DfE flout such understanding – is setting up for a big fight. There is simply no doubt that the DfE are acting with a negligent regard to the welfare and education of children at the school. 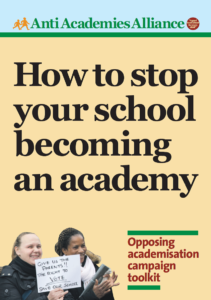 Any rational person can see that there is a process in place that is achieving the change needed, and an expensive, irreversible, highly disruptive conversion to an academy and transfer of ownership is entirely inappropriate and unjustified. But the DfE have an alternative agenda to pass as many schools as fast as possible into private hands. The very way they behave confirms this without a shadow of doubt. They are doing this undemocratically, knowing all too well that they are not doing what is best for the pupils. I have frequently recommended a public inquiry into their bullying behaviour. I do so again now.